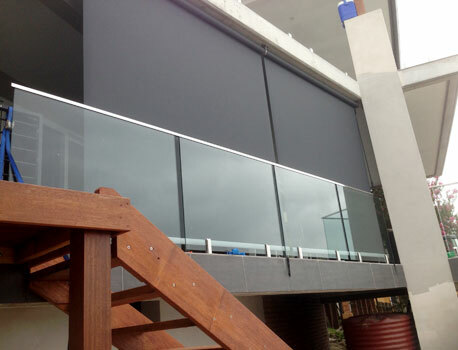 Shade Cloth Outdoor Blinds achieve shade protection whilst allowing air movement and aesthetic appeal. In contrast to Clear PVC blinds, Shade Mesh Outdoor Blinds offer a level of UV and sunlight protection. Most fabric options allow good visibility from the inside out whilst still providing a degree of privacy. Air moves through the fabric allowing heat to escape. Although not 100% rain proof, shade mesh blinds will provide an element of protection against the rain. Light rain tends to hit the shade mesh and fall to the ground on the outside of the blind, the small proportion of water in a heavier rain fall that would make its way inside the perforations of the mesh don't travel very far. Mechanism - Straight Drop, Wire Guides or Ziptrack® blinds. Material choices - Choose from a large range of shade mesh colours. Operation - motorised or non motoried. Check out our Outdoor Blinds photo gallery to see examples of our work and find the solution that is right for you. We have installed shade mesh blinds in domestic applications around pergolas, decks, across windows. Ziptrack® blinds enable outdoor areas to be fully enclosed to offer protection against sun, uv, rain, insects. Commercial installations of shade mesh blinds have included cafes and restaurants. In these applications seating capacity is usually increased as patrons are more comfortable and areas that may not otherwise be used in certain weather situations come into play.